Join us for a Peace Talk at the PDF Center for Peace & Justice on Friday, October 10 from 7 to 9 p.m. Director of Communications and Outreach, Kathy Sharkey, hosts the event with PDF-supported activists from Breaking Walls and Third World Newsreel, and filmmaker and producer Julia Mintz. Light refreshments and great conversations with activists from PDF-funded organizations! This event is free and open to the public. The PDF Center for Peace & Justice is located on 44 North Prospect Street in Amherst, MA. Parking is available on street after 5 p.m. or at CVS across the street. Breaking Walls is a non-profit, international creative writing and performance initiative. It empowers youth to discover their voice and offers them a platform on which to use it. Breaking Walls relies on partners, sponsors, mentors, volunteers and friends to engage, empower and support young people as they become creative artists and empathetic leaders of tomorrow who actively advance personal transformation and social change on the global stage and within their home communities. 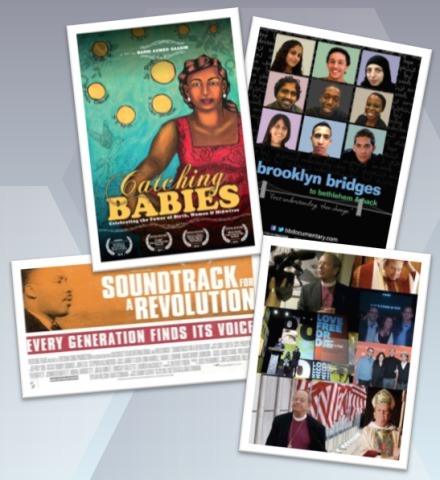 The non-profit is the outgrowth of the films Bethlehem to Brooklyn: Breaking the Surface (2009) and Brooklyn Bridges- to Bethlehem & Back (2011), which challenge the media’s negative imaging of youth. Third World Newsreel (TWN) is an alternative media arts organization that fosters the creation, appreciation and dissemination of independent film and video by and about people of color and social justice issues. It supports innovative work of diverse forms and genres made by artists who are intimately connected to their subjects through common bonds of ethnic/cultural heritage, class position, gender, sexual orientation and political identification. TWN promotes the self-representation of traditionally marginalized groups as well as the negotiated representation of those groups by artists who work in solidarity with them. Ultimately, whether documentary, experimental, narrative, traditional or non-traditional, the importance of the media promoted by the organization is its ability to effect social change, to encourage people to think critically about their lives and the lives of others, and to propel people into action. Julia Mintz is an award winning creative director and an accomplished multi-grant recipient for her work in the visual arts. Julia has taught seminars on filmmaking and digital post-production at numerous workshops worldwide. She has held an adjunct faculty position at LIU in NYC. Mintz is co-founder of Full Res Productions, a high definition and film production company, which focuses on the integration of creative story telling using new technologies and integrated design for films. Mintz’s documentary about the Jewish Partisans, about the Jewish resistance in Eastern Europe during World War II, is currently in production. Mintz has worked on many of the country’s most celebrated documentary films. Her most recent projects include: Love Free or Die, winner Sundance Jurors Special Choice 2012 for Independent Lens, Joe Papp in Five Acts, premiered Tribeca 2012 airing American Masters, CA State of Mind: The Legacy of Pat Brown, aired on PBS 2012, and Broadway or Bust, the PBS mini-series. Julia post-produced and associate produced the documentary Soundtrack for a Revolution, about the civil rights movement, which premiered at Cannes and was nominated for Writers Guild, Producers Guild, and Int’l Doc. Assoc. Awards, and was short-listed for an Academy Award® 2009. To view a more complete listing of her projects, visit her pages on IMDB and LinkedIn.